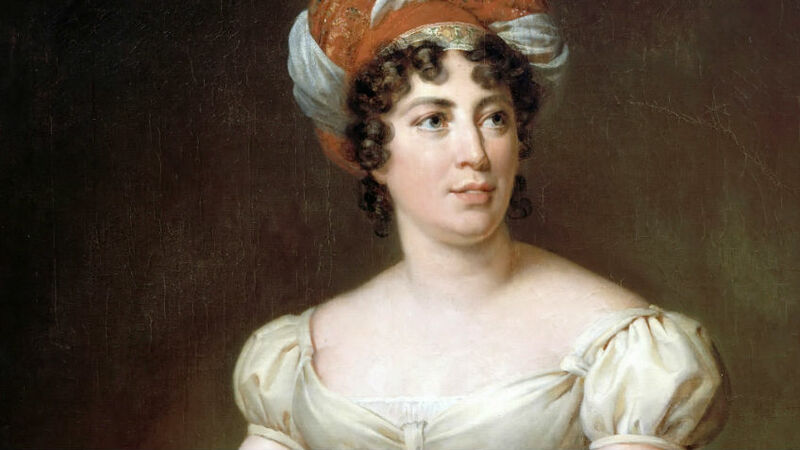 Anne-Louise Germaine Necker, Baroness of Staël-Holstein, usually known as Madame de Staël, (1766-1817), was one of the most fascinating, intelligent and influential women of the French revolutionary and Napoleonic years. Famous in her own time, she was a liberal thinker and writer who lived through the tumult of the French Revolution (1789-99) and Napoleon’s rule. Brilliant, passionate and intense, she lived life through her passion for politics and love at the highest levels of society. Staël was the daughter of Jacques Necker, France’s finance minister to King Louis XVI, the monarch who lost his throne during the French Revolution. She was known as Madame de Staël, after her marriage to Eric Magnus de Staël-Holstein, a Swedish nobleman who became the Swedish ambassador to the French Court. Her mother, Suzanne Curchod, created the most brilliant Parisian salon of the 1770s and 1780s, which attracted philosophical and literary luminaries such as Rousseau and Voltaire. Staël absorbed this intellectual environment from childhood and created her own dazzling salon in the years before the French Revolution. Her salon attracted politicians dedicated to reforming France into a utopia of justice, weakening the already-threatened monarchy. As salon hostess, she impressed her audiences with her intellectual brilliance, conversational vivacity, emotional intensity and enthusiasm. In 1788 –89, France faced social and economic collapse, culminating in the fall of the Bastille in July 1789. In 1790, Staël left for Switzerland, but returned to Paris in the winter of 1790-91 and turned her salon into a forum for all shades of moderate opinion, which earned her the hostility of both the extreme right and the extreme left. She witnessed the escalation of the violence of the French Revolution (The Terror) in June 1792, when armed mobs marched on the Tuileries palace, and violence escalated in August 1792. Staël was lucky to escape with her life. She was sent to the Hotel de Ville, the headquarters of the Paris Commune, the revolutionary government. Here dozens of citizens were being condemned to death, but in an amazing stroke of luck, a friendly Commune official, Pierre-Louis Manuel (1751–93), organised a passport and allowed her to leave. In Switzerland, Staël organised a scheme to provide dozens of French citizens with Swiss passports belonging to Swiss citizens to allow them to escape France. Staël condemned the Terror and the executions of the royal couple, but was committed to the idea of the Revolution. The French Revolution was, she said, the triumph of the Enlightenment, the means to achieve a representative government towards which the human spirit everywhere aspires. When Napoleon became leader of revolutionary France, Staël felt the weight of his despotic rule. Under his yoke, no independent voice could be heard. In 1810, Staël attempted to publish her seminal work, Germany. Napoleon considered the work to be anti-French, and ordered it to be pulped mid-printing. She was ordered out of France and excluded from Napoleonic Europe. Travelling to Geneva, Staël wrote the story of her persecution by Napoleon between 1800 to 1810 in her work Ten years of exile. Staël’s political legacy has been generally identified with the defence of “liberal” values: civil equality, individual freedom, and the limitation of power by constitutional rules. However, she was aware that there was a wide gap between abstract notions of liberty and the damage that political unreason, such as that seen during the French Revolution, could create. She struggled with crucial questions: How do we reconcile the demand for popular participation in public decisions with the need for stable and efficient government? What is the most desirable balance between legislative and executive power? What sort of persons should represent us? Should all beliefs and opinions be freely expressed, whatever the consequences? How do we deal with terrorism from within our own society? Before she had turned twenty-one, Staël had written a tragedy, Jane Gray, and another play, Sophie. Her major fictional works, in which she portrayed women as enslaved by social constraints, include Delphine (1802) and Corinne, or Italy (1807). However, it was through her works of literary and social criticism that she made her reputation. In her Lettres sur les escrits et le caractere de Jean-Jacques Rousseau, (Letters on the works and character of Jean-Jacques Rousseau), published in 1788, she discussed the consequences of Rousseau’s political ideals and proclaimed her belief in an English-style constitutional monarchy. In 1793, Staël wrote De l’influence des passions sur le bonheur des individus et des nations ( A Treatise on the influence of the passions upon the happiness of individuals and of nations). She wrote poignantly on the impossibility of exceptional women achieving true satisfaction in both love and work. Her most important political work was published posthumously in 1818 and has become a classic of liberal thinking: Considerations on the principal events of the French Revolution. State Libray Victoria has many other books by and about Madame De Staël. More books are listed on the State Library Victoria catalogue. Use the search term Madame de Stael to find recent and older books.